Your vertebrae protects your spinal cord, provides attachment points for muscle, ligaments, tendons and allows for coordinated movements. Its structure supports us in an upright posture and allows for movement while at the same time providing protection to the spinal cord. All functions and movements are a coordinated effort of your brain, spinal cord, and the nerves branching out between the vertebrae to innervate all the tissues in your body. The spinal column starts with the sacrum and has 24 segments of bone stacked on top of one another with the skull supported on top. There are three regions, the lumbar (lower) spine, thoracic/dorsal spine, and the cervical spine. Each segment is interlocked with a disk between each bone and facet joints, two on either side, locking them in place from behind. Individually the spinal bones have little movement but when stacked together(all 24), your spine moves much like a stiff rubber hose. The exception is in the upper cervical spine at the level of C1 and C2, or atlas and axis vertebrae. The atlas (C1) does not have facet joints interlocking it to the axis (C2) nor to the skull. This allows for more movement enabling us to turn our heads in different directions so we can react to what we see and hear. Accidents and injuries occur, resulting in a misalignment of the C1 vertebrae to the right or left and usually with some twisting. 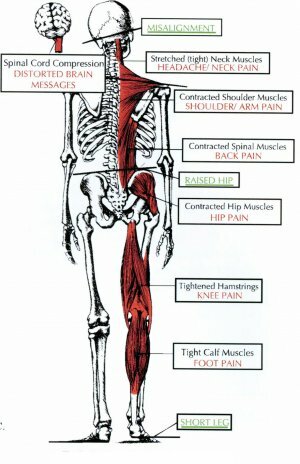 Muscles in and around your spine react in a way which further causes your body framework to be out of balance. In a neutral upright position, your body may have head tilt, a high hip, twisting between your shoulders and hips, an upper body lean to the right, left, forward or backward, and a physiological short leg present. This condition effects your bio mechanics and interferes with your nervous system, leading to a host of health problems. Analysis of x-rays and a gentle adjustment to correct the alignment of your head and neck to the proper position will bring back spinal balance and reduces stress on the nervous system allowing the body to heal.